Egypt’s Air Force has hit Islamic State (IS, formerly ISIS) positions in Derna, Libya, after the execution of 21 Christian Egyptians by the terrorist group. Libyan forces loyal to the authorities have also targeted the IS in the country, a commander said. 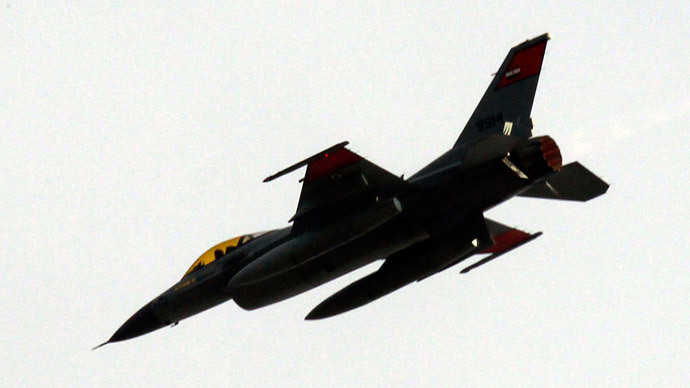 Up to 50 militants have been killed in the airstrikes on Libya, Egyptian state TV reported. Egypt’s military has issued a televised statement, confirming the dawn strikes and stating that the attacks targeted IS camps, training sites and weapons storage locations in Libya, Reuters reported. In a televised address, President Abdel Fattah Sisi said Egypt "reserves the right to respond in a suitable way and time." He also declared seven days of national mourning. Mohamed Eljarh, a journalist on the ground, has reported on his Twitter that there have been at least eight airstrikes on IS positions, and that Egypt’s military has stated it is only the beginning of its response to the Copts’ killings. Also, Egyptian security officials have said that the country’s air forces have launched a second wave of strikes on IS positions In Libya, AP reported, citing anonymous sources. Libyan warplanes also bombed targets in the central Libyan cities of Sirte and Ben Jawad, according to the country’s air force commander. Earlier, Libyan forces joined Egyptian planes in Derna to assist in the strikes. France and Egypt have called for a UN Security Council meeting, urging "new measures" against the IS. The five-minute video released on Sunday demonstrated the Coptic Christians being walked in orange jumpsuits, with the terrorists forcing them to kneel and then behead them. The caption on the video read, "The people of the cross, followers of the hostile Egyptian Church." The Egyptian Foreign Affairs Ministry prohibited entry to Libya for the Egyptian citizens following the appearance of the video. The images of the killings first emerged on Thursday, in the IS magazine Dabiq. The men were allegedly kidnapped from the Libyan city of Sirte on two occasions: December 31 and January 3. This is the first airstrike carried out on the IS positions by Egypt – at least the government previously denied any involvement. It joins its Middle East and North African allies Jordan, Morocco, Bahrain, Saudi Arabia, United Arab Emirates and Qatar. So far, apart from the US, which leads the Western military drive against the IS, the UK, Canada, Australia, France, Germany, Belgium, Denmark, Italy, Norway, Portugal, Spain and the Netherlands have participated in the operation. Iran and Turkey have also intervened with their troops on the ground over the past year. Syrian and Iraqi Kurds are taking part in the operation, mainly with the help of Turkish and Iranian forces. Egypt’s Coptic Orthodox Church said it was sure that those who beheaded the Egyptians will be punished. “The Orthodox Church ... is confident its homeland would not rest until the evil perpetrators get their fair retribution for their wicked crime,” the Coptic Church said in a statement on its Facebook page.